JUSTIN’S PICK :: SAVIORS #1: It’s a light week this Christmas at the comic book store, with the usual suspects of the Justice League and the Avengers ready to stuff your stockings. But for those of you who like to wander off the beaten path, Saviors is a book that certainly deserves your attention. 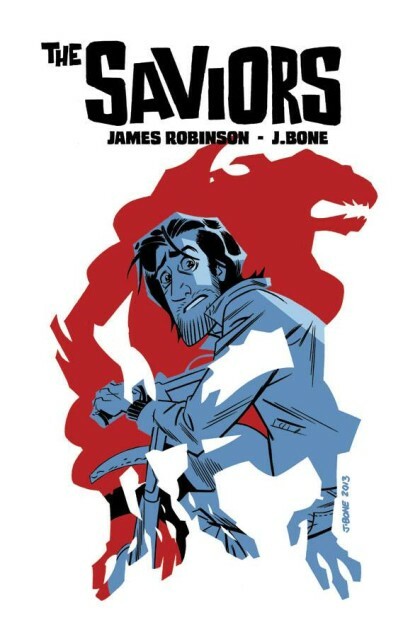 An unlikely team of fan favorite creators – writer James Robinson and cartoonist J. Bone – craft an interesting tale of small town boredom, fatal acceptance, casual drug use and a weird, alien menace. Your guide to Passburg is Tomas Ramirez, a prototypical slacker. When his idyllic life suddenly erupts into a bizarre chase, both he and the reader are caught in a literal cliffhanger. James Robinson requires no paltry accolades from a scrub such as I; J. Bone’s art is, as always, a thing of crystalline beauty. A perfect team on a great book, don’t let this gem get lost in the shuffle.